The current boom in the use of firewood for heating has led many people to ask what alternatives there are to splitting firewood by hand. One option is to use a logsplitter which uses hydraulics but can be powered by petrol, tractor or electric. Not easy to use off grid but useful back at home or in a garage or workshop. The purists may prefer to use an axe but, even apart from the exertion of using an axe, there are dangers both from the blade and from flying logs. Splitting by axe also involves collecting the split pieces which adds work. According to Janet Welburn who specialises in supplying logsplitters, "often people get to an age when they don't want to use an axe or they are producing logs in large amounts and want the convenience of a mechanical logsplitter". Because it works through hydraulic force the "blade" isn't sharp but simply presses down until the log splits - typically exerting a force of 5- 10 tons. With a splitter like this one you have much more control than splitting with an axe so you can avoid making the split where there is a knot or other obstruction. You need to use both hands to operate the machine and as you push down on the handles this brings down the splitting blade. These logsplitters are not expensive, especially if they are going to be used intensively - they range in price from only about £290 up to about £4,000 for very industrial models. The one pictured is an eco 60 model costing about £650 plus vat though where I saw it at Woodfest Wales it was being offered for £499 including vat and local delivery. Clearly the rising price of non-renewable fuels has been helping boost demand for woodstoves and firewood. Says Welburn, "if British Gas announce a price rise we can take orders for 5 logsplitters that day". Ryetec sell several hundred a year from Malton, North Yorkshire, where they are located. Most of these are imported from China, Italy and France although there are apparently still a couple of UK manufacturers. Angus, I forgot to mention, the screw type (ideal for tractors of low oil flow) are dangerous. Angus (not the auther, or me!) you said your looking for a splitter for a tractor. You have to look at tractor data.com to find out what your hydraulic output is, then you need to find a suitable splitter. I have a MF250, it has a good output of 59, litres per minute, so I bought a German made splitter, and the best splitters come from either, France, Germany, or Italy. The make I have is called AMR, and they are sold here under an English company called Rytec, who make farm machinery. It is a 12 tonne rated splitter, and I use a 4 way axe head, which cuts splitting time in half. It is worth paying double for a decent splitter rather than the rubbish that is generally made in the UK, sorry to offend anyone with that comment. I hope that info is useful to you. I use a website (firewoodandlogs.co.uk) to buy my firewood, avoids the hassle of this but it does look fun! 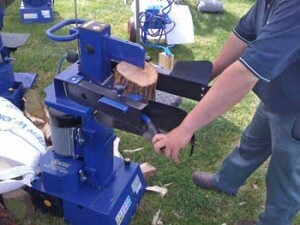 I purchased my log splitter in http://www.utilityrbc.com and so far i love using it and it is really cool. Thats was an interesting and well written blog, I m not the author (just coincidentally have the same first name). I ve been looking for a splitter for my tractor. There are so many types on the market. Cant decide if I want a crew type driven off the PTO or a hydraulic. I would prefer to buy Scandinavian or Eastern European, does anyone know of manaufacturers from these regions of Europe? Hi Carol, I havn’t actually used one of the manual log splitters though have had plenty of experience with the mechanical variety! Looking at the videos on the link they do seem to do the job, I would go to a good tool suppliers with a few logs and they should let you try one out for yourself, good luck and happy splitting. We use the smart-splitter for splitting our oak for use at home, and it works well. We’re canal boaters, and it’s a pain carrying around petrol or having sufficient electrics to run machine tools.